On 18 December 2015, Yasuaki Yamashita, an atomic bomb survivor (hibakusha) from Nagasaki who now lives in Mexico, met with UN Tour Guides and interns in New York to share his testimony of the horrors he experienced 70 years ago. Yasuaki Yamashita, a 76-year-old who makes his home in Mexico, is among the dwindling number of hibakusha – people alive today who survived the atomic bombings of Hiroshima and Nagasaki in 1945. Many, like Mr. Yamashita, have since those horrifying events, dedicated their lives to peace and continue to work for nuclear disarmament. 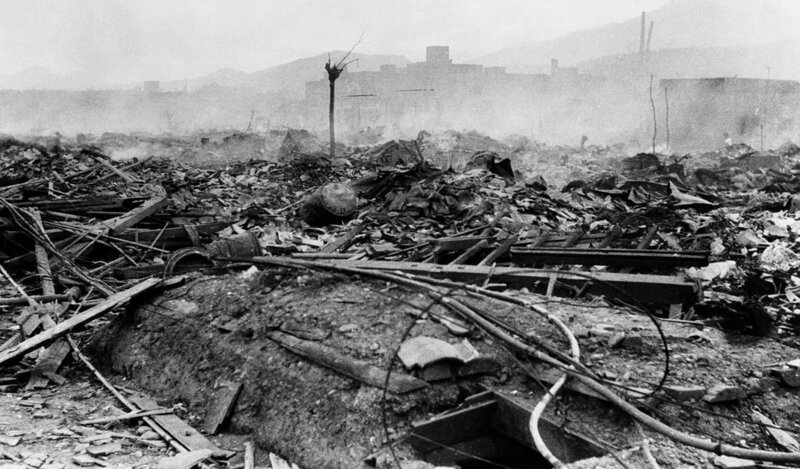 However, what many people may not realize is that it was common for survivors to claim to have not been in Hiroshima or Nagasaki at the time the atomic bomb was dropped. “It had to be kept a secret…no one would marry a survivor because of radiation that could lead to deformed children,” explained Mr. Yamashita. Mr. Yamashita recounted what happened at the moment of the explosion: “I was playing by myself in front of my house – close to my mother, who was preparing the midday meal. Normally, I would go with my friends to the mountains to catch cicadas and dragonflies. This was how we played because we didn’t have any toys at that time. “A neighbour passed by saying that an airplane was flying over the city and that we must be very careful. But my mother reassured us that nothing, as usual, was going to happen. The city had suffered several air attacks, so it was not unusual to have a plane flying overhead. 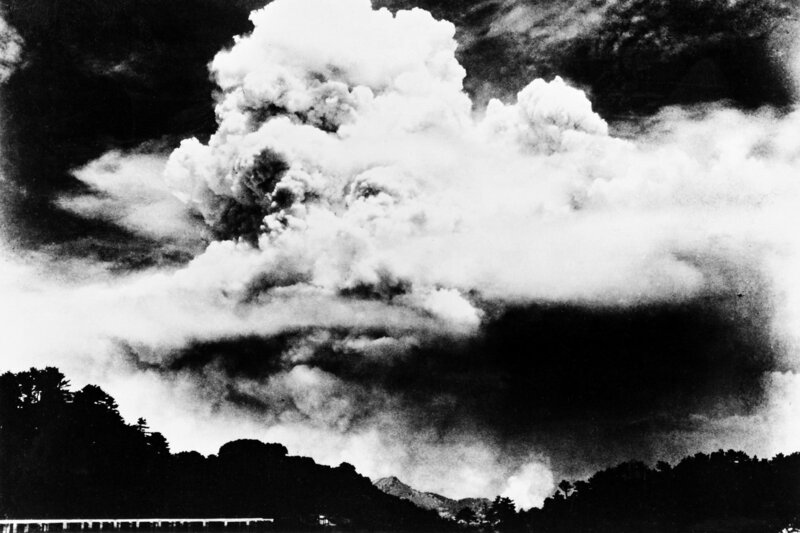 Atomic cloud spreading over Nagasaki as seen from about 3 kilometres south of the hypocentre about noon on 9 August 1945. “At that same moment, my sister ran to my mother telling her that a radio announcement said an airplane was flying over the city so we must be very careful. My mother immediately called me to enter our private shelter. In those days, most Japanese houses had a small hole dug out under the floor, in case there wasn’t enough time to make it to the community shelter. “She took my hand and the moment we entered the house came a tremendous flash – like a thousand lightning bolts at the same time,” Mr. Yamashita recalled. “It was so strong. My mother threw me down on the floor and covered my body with her own. Then came a tremendous explosion and we heard many things flying over us. All of a sudden there was total silence, so we stood up and saw that the windows, door and roof had disappeared. There was tremendous destruction, so we crawled into the shelter. “My sister was crying. She had been injured. When my mother asked her what had happened, she answered that she felt oil dripping down her head. She was referring to the chemical weapons the United States had threatened to use. Since no one knew what a chemical weapon was, people thought it would be like a kind of oil. Mr. Yamashita noted that about 30 minutes after they arrived at the community shelter, his friends who had been playing on the mountainside came back. One had severe burns on his back which then became infected with maggots. He died about two days later. Mr. Yamashita acknowledged that not going with them that day may have saved his life. The smoldering ruins of Nagasaki, about 700 metres from the hypocentre of the explosion, as seen on 10 August 1945. When Mr. Yamashita was 28 years old, he had the opportunity to work as the manager for the Japanese Press Office in Mexico City, during the 1968 Olympic Games. He made the decision at that time to stay, and lives to this day in San Miguel de Allende. He started his peace work in 1995, and explained why he still feels compelled to share his story publicly. “Before that , I kept my status as a survivor a secret. At that time, news spread that France was doing atomic testing in the Pacific. My friend’s son in college called me to say that as an atomic bomb survivor, it was important to share my story of what had happened in 1945. He invited me to speak at his school, but I said no because it was too painful for me to share my experience. “He insisted, saying it was essential for people to understand, so I accepted. I went to the school, but initially it was very difficult, so painful. However, when I finished, my pain started to disappear. Since then, I have come to realize that this is my therapy. I also understand that if we survivors do not speak out, the same tragedy could happen again. “For us survivors, it is so very important to share our experiences because we do not want others to suffer as we have. After 70 years we are still suffering, people living with and dying from consequences of the bomb. We need a peaceful life. 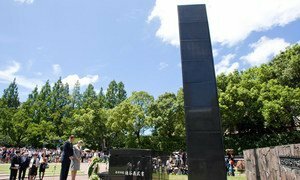 In a message commemorating the 70th anniversary of the atomic bombing of Nagasaki, United Nations Secretary-General Ban Ki-moon today paid tribute to all those in the Japanese city and around the globe who are striving to rid the world of nuclear weapons.